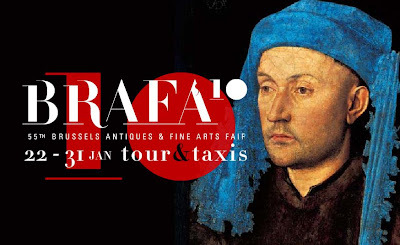 I'm out of town this week on a press trip to Brussels where I'll be attending BRAFA, the Brussels Antiques and Fine Arts Fair. It should be an interesting trip, and I look forward to filling you in on it when I get back. See you next week! 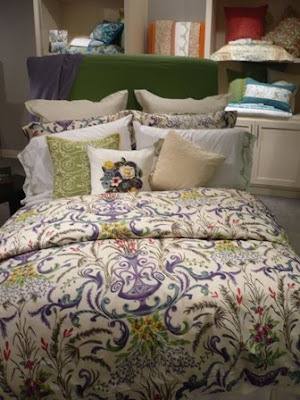 Atlanta has been abuzz this past week, not only due to the frigid weather (I never thought I'd say that 50 degrees was balmy) but also because of the Atlanta International Gift and Home Furnishings Market that just ended. 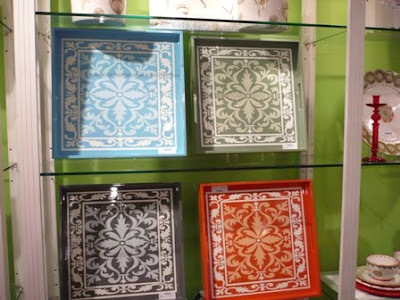 I'm pretty certain that most of you in the design community are aware that the AmericasMart is a great resource for designers and their clients. 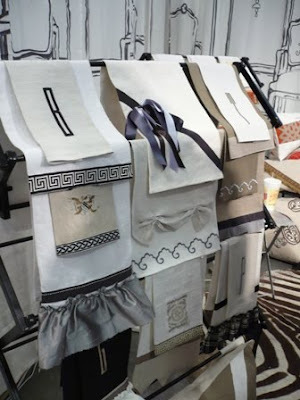 Think of ADAC as the place to buy fabrics and wallcoverings and AmericasMart as a destination for accessories, rugs, lighting, and accent furniture. (If you own a retail shop, well then by all means you must visit the Mart, especially during market). 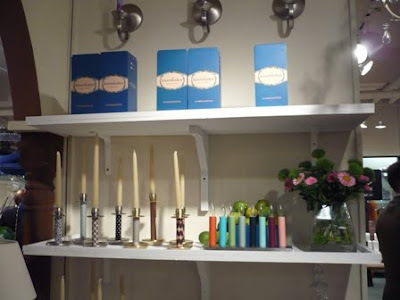 I spent last Friday walking through both the permanent showrooms as well as the temporary exhibits, and I spotted all kinds of fabulous things: linen, tabletop, and home fragrance, just to name a few. I even spotted a few friends and acquaintances, including my neighbors at Veranda (we work in the same office building). While there was a lot of ground to cover (and unfortunately I couldn't see it all), I did manage to take some photographs of a few lines that caught my eye. 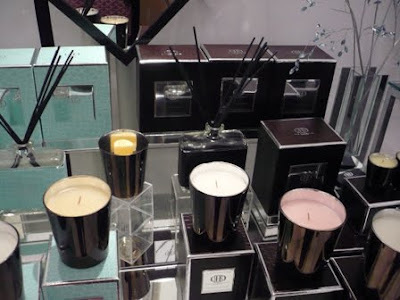 While most of these lines sell directly to retail shops and designers, you can visit their websites to locate retailers in your area. 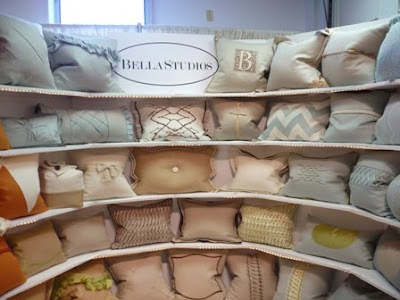 Bella Studios' pillows are so charming. 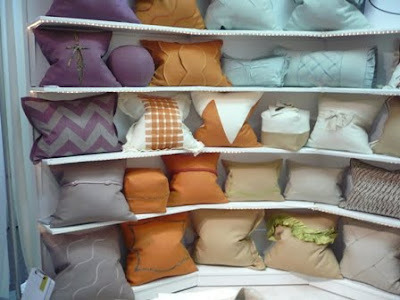 I love the different shapes (flanged, box, ball), but I'm especially taken with the details- cording, ties, and knots. 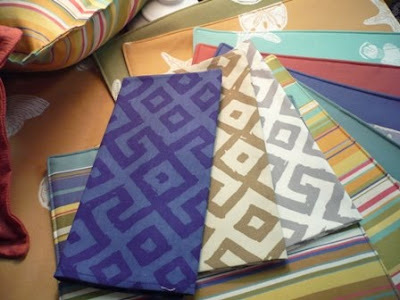 Patricia Spratt For The Home is a good source for fun, casual table linens. 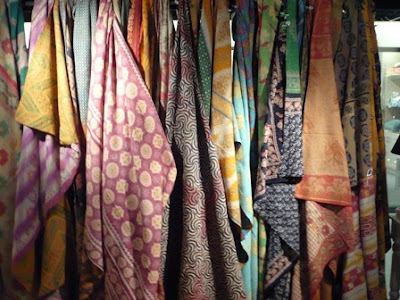 All of the vivid prints you see above can be made into napkins, mats, cloths, and runners. 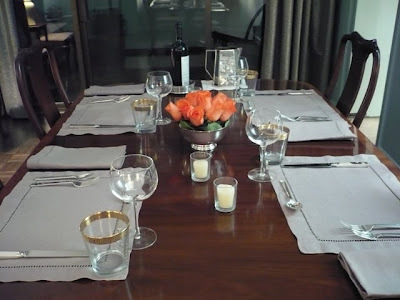 Those napkins are rather Alan Campbell, don't you think? 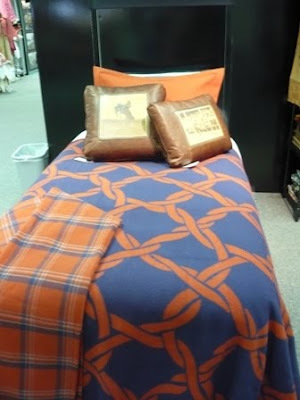 How great is this chain link print blanket by Pendleton? 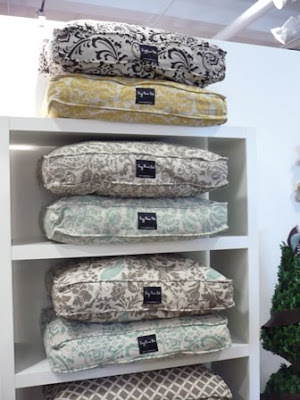 I really wish I could give you more info on these cotton blankets from Vagabond Vintage, but all of the sales reps were busy with customers (always the sign of a successful show) so I don't what the story is. 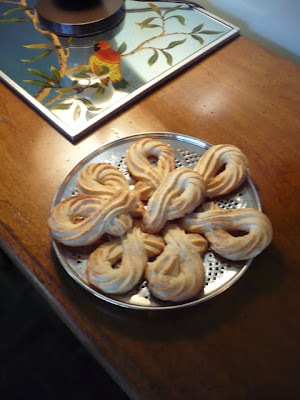 I do know, though, that they'd look great on a bed or as a tablecloth. 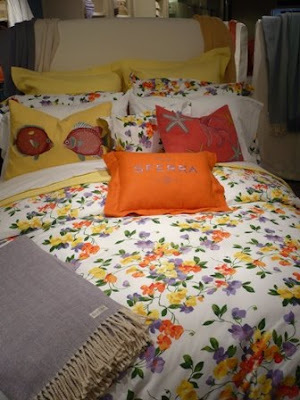 1891 by Sferra had some new additions to the line including these sweet printed duvet covers. 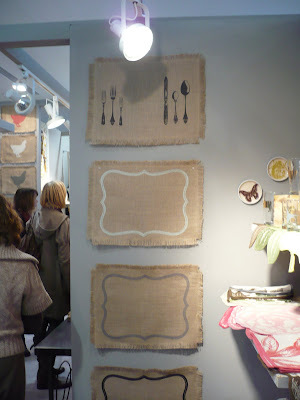 A nice option if you're looking for something different from plain white linen. 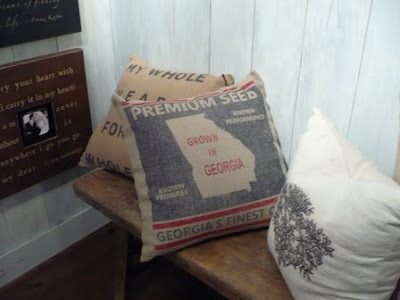 If I had a home in the mountains or one in South Georgia, I would buy this SugarBoo Designs pillow in a heartbeat. Because you know, I was grown in Georgia too. 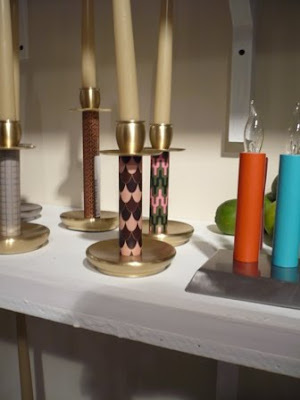 April Pride Allison of kaarsKoker was at the Mart with her popular line of candle sleeves. 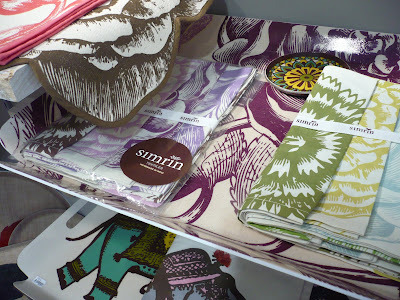 The detail shot shows some newly introduced prints. 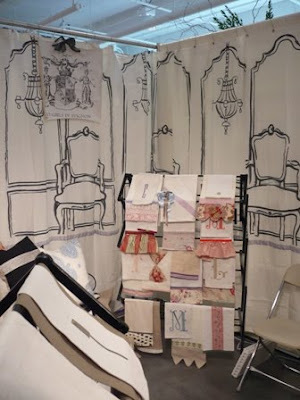 Not only do I think the linens from Two Girls in Avignon are scrumptious, I'm also pining for their painted canvas backdrop. For the pampered pooch (i.e. 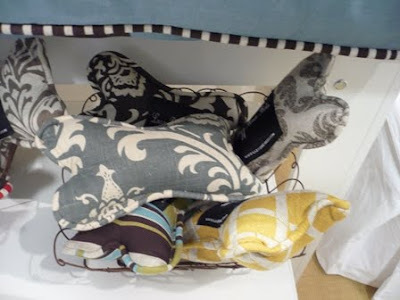 Alfie), stylish dog beds and chew toys from Lazy Bones Beds. And, they're made in the great state of Mississippi. 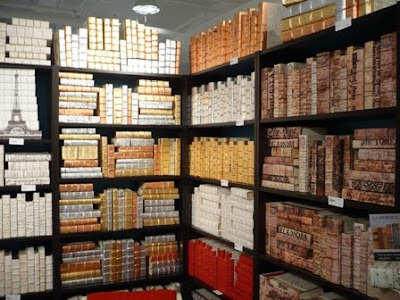 If you need to fill in some gaps in your bookshelves (not a problem for me, but it might be for some), E. Lawrence, Ltd. has leather bound and vellum covered books. home, James! 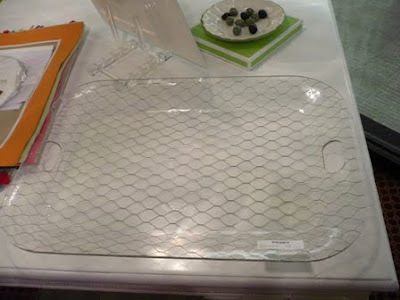 has great items for the table, including these trays. I especially like the chicken wire encased in plastic. Did you see that great House Beautiful article last month about McMillen and their new venture, McMillen Plus? 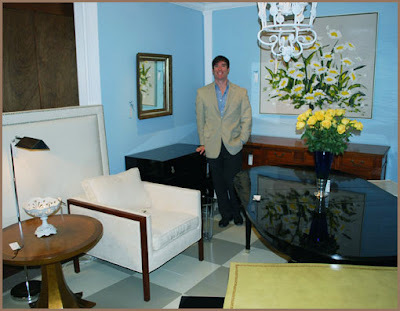 For those of you who didn't read it, the venerable decorating firm McMillen, that bastion of traditional design that many of us admire, has opened a new division, McMillen Plus, which is geared towards a younger clientele. A great idea, really, as many of us who grew up in traditional homes want the comfort and security of traditional design- but we want it served up with a healthy dose of the modern. Yesterday, Vogue's website profiled "It Girl" Lilly Bunn Weekes, head designer of McMillen Plus. (That's Lilly at top with her daughter Grace. 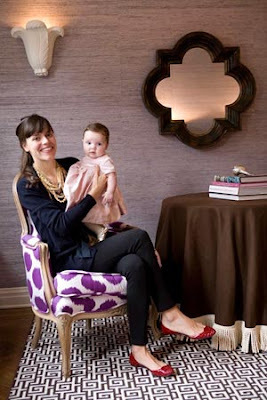 I'm loving that room...and her shoes.) 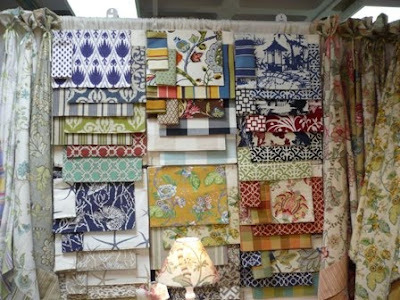 In addition to Lilly, designers Christine Grace and Elizabeth Pyne round out the McMillen Plus team. The McMillen website is now up and running, and you can see many images of the firm's work. Plus' section only includes the images below, but based on these four small photos, I for one cannot wait to see more! 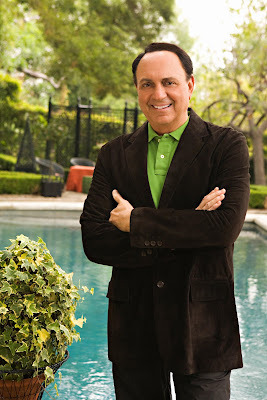 ...make sure to stop by the Dallas Market Center to attend Joe Ruggiero's lecture on global design and the inspiration that he's gleaned from his far flung travels. The talk is part of their "Lunch and Learn" series. If I were in Dallas, I'd go because I've been a fan of Joe since his days of hosting Homes Across America on HGTV. That was truly the best show on that channel; too bad it's no longer on. For more information on the lecture, click here. So for my dinner last night, I had my friend Mattie at Cafe Lapin make the entree. Mattie will make all kinds of wonderful dishes and casseroles for you if you call ahead of time. I hear Mattie makes a mean seafood lasagna (ordered often by a few of Atlanta's top designers), but I opted for chicken and dumplings. All I had to do was bring in my Apilco white casserole on Monday, and Mattie had the dish ready for me late yesterday afternoon. How easy is that? I did toss a green salad, but obviously I didn't have to exert myself for that chore. Dessert was easy too- store bought Blackberry Cabernet sorbet with some of Mattie's delicious cookies. Why am I going through my menu for last night? I guess because I realized that I often talk the talk about easy entertaining, but I decided that I should walk the walk. Having a weeknight dinner party is easy...if you have someone like Mattie to make the dinner for you. If you live in Atlanta, you should definitely visit Cafe Lapin not just for lunch or dinner, but to talk to Mattie about catering. He's the one who made all of that great food for the Summer party I hosted for my sister. I'm ready to host another small dinner just to serve his seafood lasagna. Anyone care to join me? 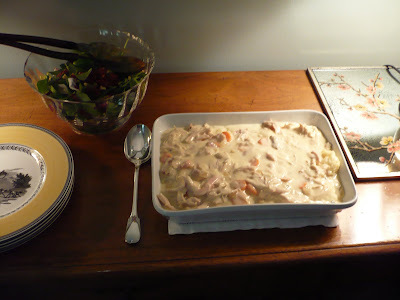 I realize that chicken and dumplings is not the world's most beautiful dish, but this one tasted beyond fabulous. We were all spooning up the sauce from our plates. The image at the very top was my four minute table setting. Nothing fancy here. 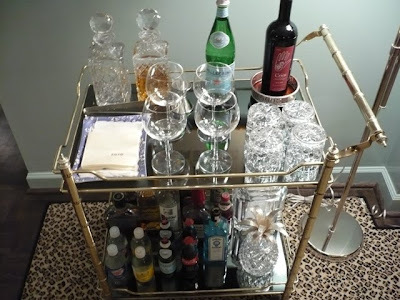 My bar is always set, so I just had to throw some wine glasses on it and bottles of wine and sparkling water. That was a three minute chore. The only thing that does take a lot of time is laundering the dirty linens, something which I'll worry about tomorrow. For me, Saturday is a day for shopping. It's the only day of the week during which I have time to visit new and favorite shops. The beauty of online retailers, though, is that I can shop anytime of the day or night. The latest website that I've added to my favorites list is Crawford Bray Design. 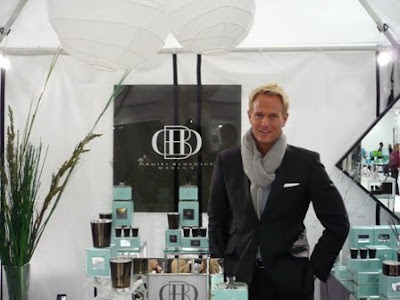 Crawford's interior design background includes receiving a certificate from Parsons School of Design as well as working as the Director of Antiques for Jerry Pair showrooms. And now, he's started his new retail venture. Crawford's bricks and mortar shop is located at Antiques and Beyond on Chesire Bridge Road in Atlanta (that's Crawford in his booth above). 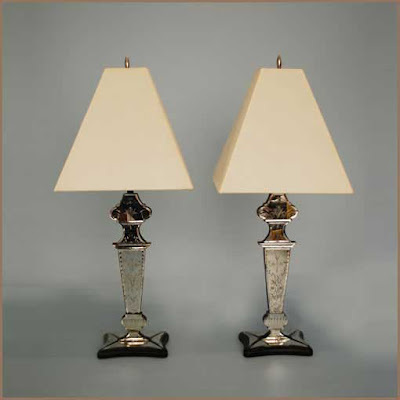 And if you don't live in Atlanta, not to worry as you can also view and purchase Crawford's finds on his website. 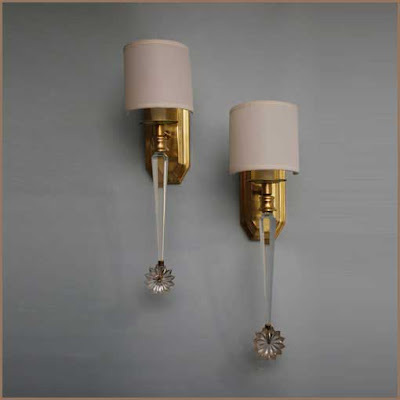 Pair of antique crystal spike sconces. 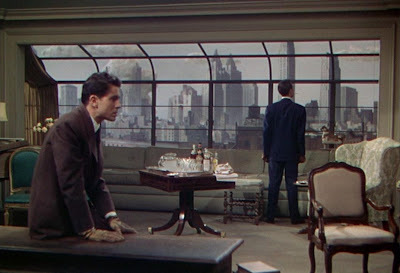 The apartment is really the height of 1940's Manhattan chic. It's traditional of course, befitting the upper class pedigree of the two murderers. 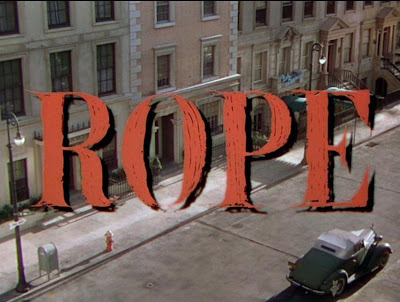 It's proper and well-mannered, an incongruous setting in which to commit a gruesome murder. 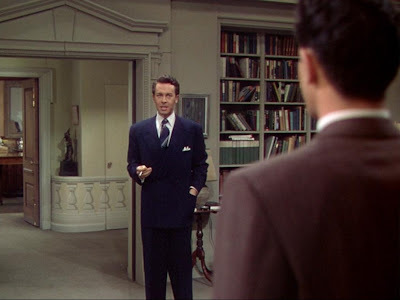 But what strikes me is how mature the apartment is, especially as its owner was a young man in his early twenties. And for that time, I don't think this was at all unusual. 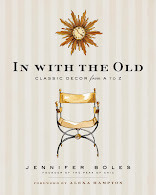 If you look back at much of the twentieth century, younger people seemed eager to become adults and to assume the trappings of their parents' generation, including grown-up homes, grown-up clothing, and grown-up parties. It's a far cry from today in which many treat their twenties as a decade long transition into adulthood. (I'm not casting dispersion, just making an observation.) I only bring this up because if a young man of 21 or 22 lived in an apartment like this today, some might think it old-fogey. Not me, mind you. 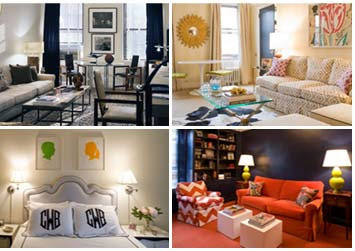 So what's so fabulous about this apartment? I'll break it down for you. Here's one shot of the living room. There's that rather modern looking banquette along the wall of windows. I've always thought the windows were a little strange looking, perhaps because I've never felt like it was in keeping with the rest of the apartment. Still, can you imagine having a view like that? This view is from the center of the living room looking into the entryway and the dining room beyond. 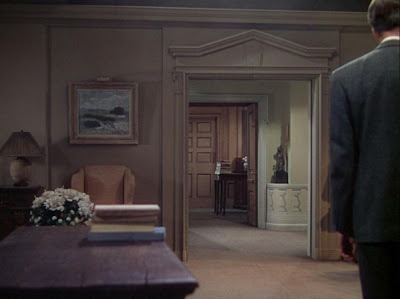 First, let's discuss the marvelous architecture surrounding that door. I look upon that with envy seeing that my home is filled with simple metal 1968 door frames- boring. And another funny little 1940's touch is the faux balustrade that was painted along one side of the entryway. Perhaps a very Hollywood flourish, but one that I like nonetheless. 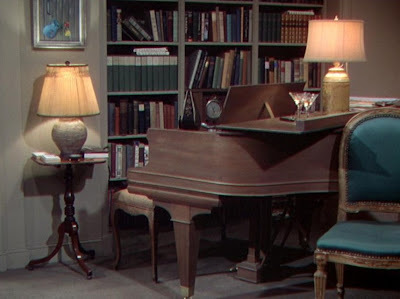 In this corner of the living room is Philip's piano (that's Farley Granger's character) where he plays that funny little tune throughout the movie. 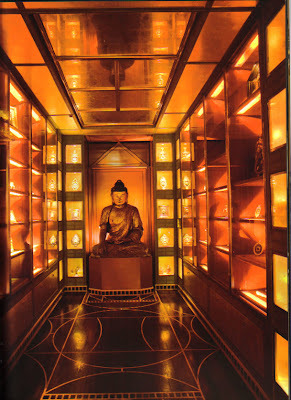 Despite the very traditional furnishings, the artwork was modern for the time. That painting above the little table was by a "Young American Primitive", at least according to Brandon. 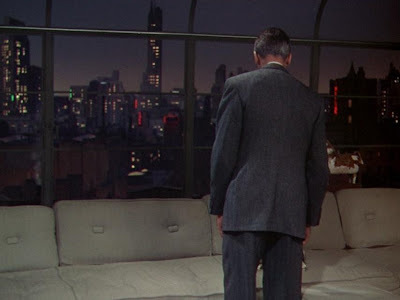 The other end of the living room looks out onto a neighboring building with a large neon sign. Check out the simple valances that are the same color as the walls. The wood paneled dining room that is a trifle mature for Brandon and Philip, and yet I find it appealing. 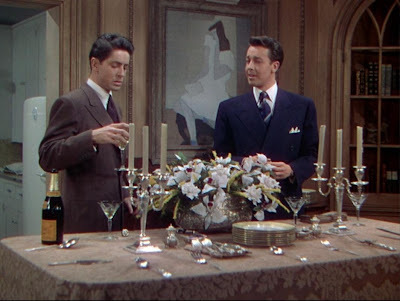 And for such young men, they owned awfully nice silver candelabras, flatware, salt cellars, and china. Oh, and it appears they're drinking Veuve Clicquot- my kind of guys. 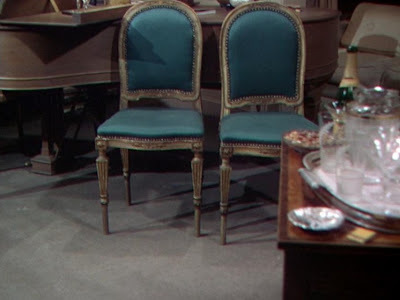 How gorgeous are these chairs? 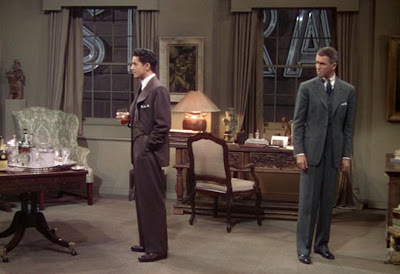 The rest of the apartment is rather somber in color, something not out of place for the 1940s. But look how that vivid blue satin upholstery sings when placed against the murky colors. I'm not showing this image because of the cityscape outside of the windows, though who wouldn't want to look out to that every evening. 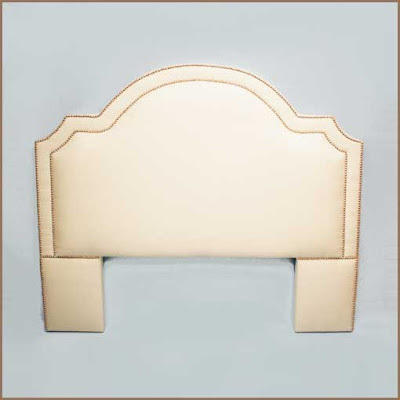 Check out the simple square button tufts on the back cushions. 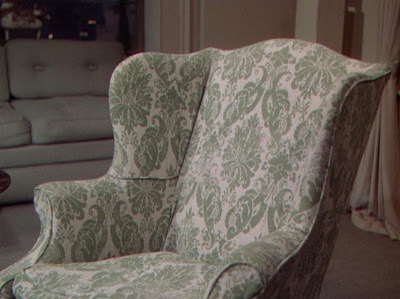 The damask fabric is a bit staid, but I do love a wing chair. My favorite part of the entire apartment? 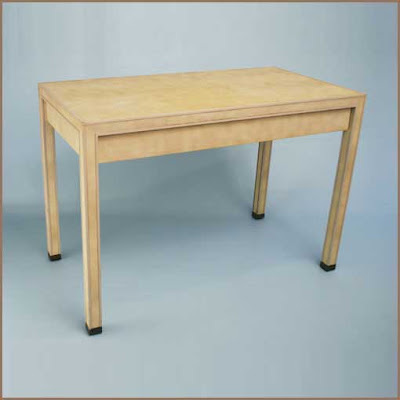 The mahogany card table that was pressed into service as a bar during a party. 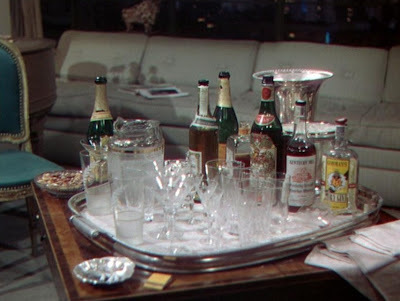 Looks like there's dry gin, whiskey, champagne (something which caused most of the guests to exclaim "Oh....it's that kind of party." Personally, I like those kind of parties! ), and a bowl of nuts. This is a bar done right. 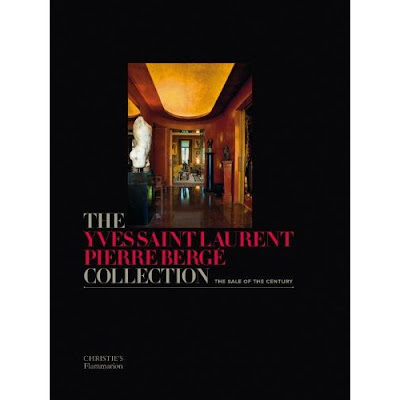 When Christie's released the YSL and Pierre Berge collection auction catalogue late last winter, I didn't waste any time plunking down my $290 to buy a copy of the five volume set. It actually doesn't seem quite so expensive now that I see that copies are available on Amazon for $900. 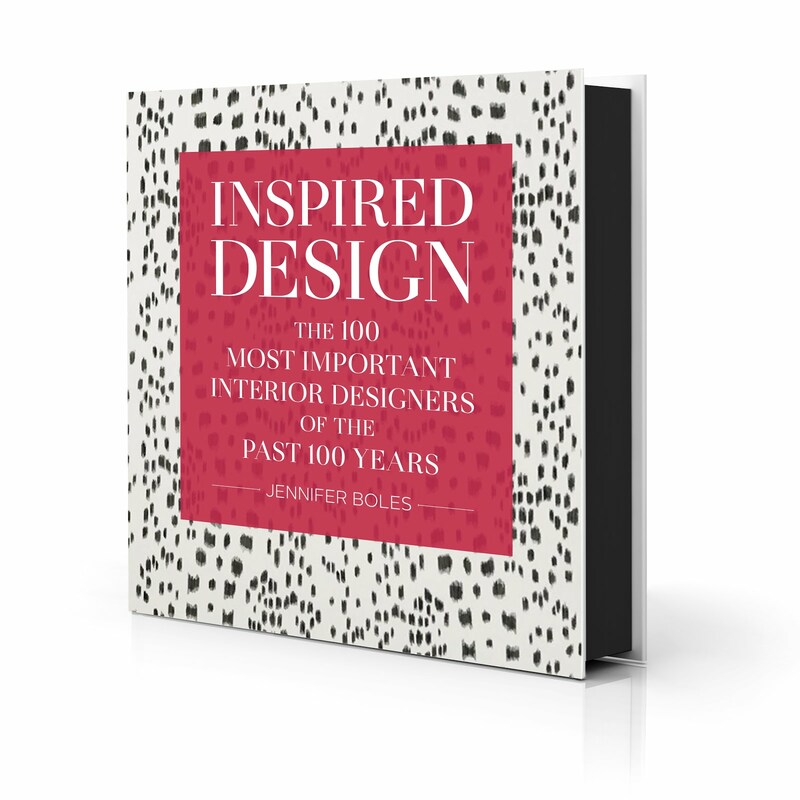 I do know, though, that some of you who wanted to purchase a copy of the catalogues were unable to do so as all 6,000 copies sold out. If that was the case, you might want to consider The Yves Saint Laurent-Pierre Berge Collection: The Sale of the Century , a Christie's/Flammarion collaboration that is a relative bargain compared to the catalogue set. While not as comprehensive as the actual auction catalogue, the book does a nice job of highlighting the stand out pieces in the pair's collection- no easy feat as the entire collection was chockablock with stellar works of art. 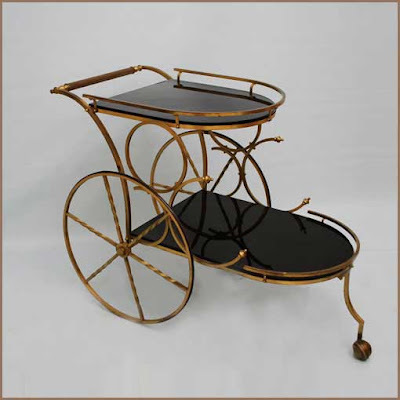 Furniture by Jean-Michel Frank, Eileen Gray, and Claude and Francois-Xavier Lalanne are featured as well as paintings by Goya and Leger. Remarks by Christie's specialists and friends of YSL appear alongside the numerous photographs, something which adds additional insight to both YSL and the collection itself. And if, like me, you were wondering how much particular lots went for, the realized prices of the entire collection appear at the back of the book. If you have the auction catalogues, the images of both the lots as well as YSL's Rue de Babylone apartment and Berge's Rue Bonaparte home will already be familiar to you, but what might be new to you are the behind the scenes photographs of the auction itself. 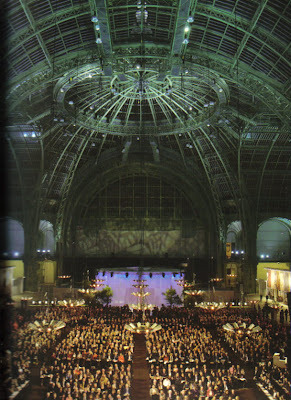 After seeing the images of the well dressed crowd in the Grand Palais, I wish I had finagled a trip to Paris to attend the auction myself. 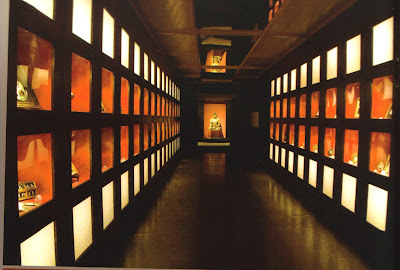 I have a feeling that I would have spent just as much time studying the crowd as much as I would have the collection itself. The real thing, designed by Jacques Grange in the 1980s. The inlaid floor was inspired by that at Franz von Stuck's Munich villa. The cabinets were lined in silk velvet. YSL's bar designed by Francois-Xavier Lalanne in 1965. 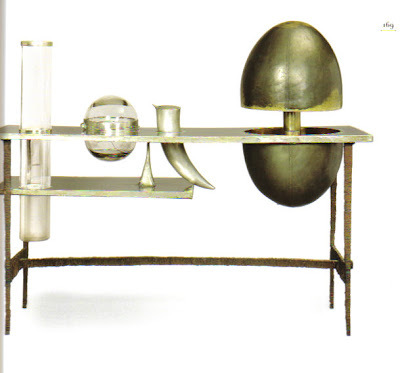 From left to right: a cylindrical crystal vase, a spherical ice bucket, a horn of plenty cocktail shaker, and an egg-shaped bottle rack, all held by a nickle silver and brass bar. 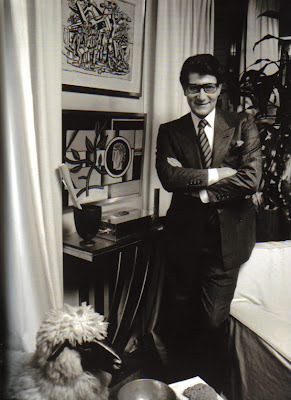 YSL in his library; the Fernand Leger painting, "The Blue Medallion" (1928), commanded 649,000 Euros at auction.